Elvis was big news filming at the Fair! 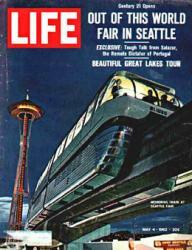 The Monorail takes us into the Future! Paula Becker and Alan Stein, historian/authors of "The Future Remembered: The 1962 World's Fair and its Legacy," were guest speakers on April 17 at Lakewood Historical Society's monthly meeting, held at St. Mary's Church in Lakewood. The topic? The World's Fair of 1962. 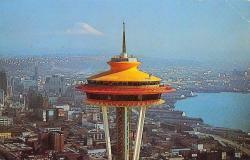 Besides the informative program (and a reminder to attend the World's Fair anniversary festivities beginning on April 21 in Seattle and continuing through October) there was a colorful display of C-21 souvenirs: from postcards and glasses to records-even a Jim Bean bottle in the shape of a colorful space needle. 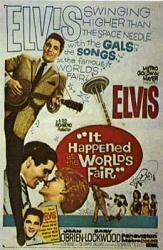 Monorail ticket taker Barbara Scott, who met Elvis Presley when he was in town to film "It Happened at the World's Fair" shared some of her stories about her summer job that year at the Fair. Best of all were the refreshments--donuts from Lakewood's House of Donuts--made from original World's Fair equipment that was purchased by the owner after the Fair was over! See the Spring edition of the Prairie Gazette newsletter for more great stories about the Fair.